The view out the airplane window was interesting enough to distract me from my knitting. 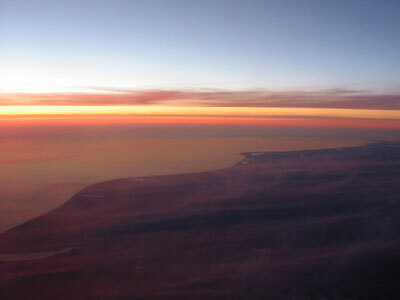 We were flying over Lake Michigan straight into a fiery sunset. Tiny pinpricks of light began appearing along the coast, their motion revealing familiar landmarks. I-43. Lake Drive. Marquette Interchange. I stuffed my knitting back into my bag and waited for the landing. My suitcase held an ambitious eight balls of yarn for a ten-day stay. Six skeins of Cascade 220 and two skeins of Tahki Cotton Classic. I didn’t expect to finish both projects, but to make a significant dent, surely, much as I did over Christmas. I think I was clinging to hope that this trip home would turn out to be equally carefree. I hadn’t planned on coming home, not yet anyways, and definitely not under these circumstances. About three weeks ago I learned that my dad has been diagnosed with metastatic lung cancer. My dad, a never-smoker from a line of people who live to be 90 and 100 years old, and with no history of cancer anywhere in the family, has the #1 cancer killer for both men and women. So instead of knitting, I’ve been reading. Steve Dunn’s Cancer Guide. Bloch Cancer Foundation. OncTalk. The list of web sites is endless. I’ve spent hours abusing my university library privileges and downloading article after article from medical journals. Instead of knitting, I’ve been cooking and cleaning and helping my parents put family affairs in order. Instead of knitting, I’ve been going with my dad to appointment after appointment. Oncologist. Radiologist. Neurologist. And then I knit. I knit before seeing the doctor, after seeing the doctor, before procedure X, between procedures X and Y. I knit thoughts of hope and health into the brightly-colored stitches. Red for luck, yellow for vitality. And maybe for Vitamin C to boost the immune system. 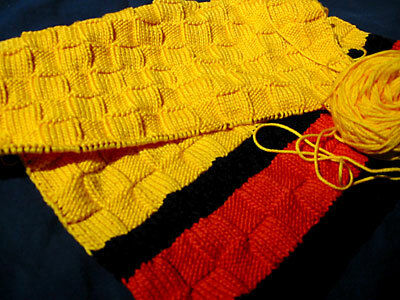 I knit, hoping that these knitting memories will turn out to be good ones. CogKnition posted this on June 1st, 2007 @ 11:47pm in Life as a Knitter, Unfinished Objects | Permalink to "Distracted"
I’m sending you good thoughts and saying little words of strength with all the stitches I’m knitting. Make sure you enjoy each other as much as possible. That was the most important thing I ever learned when my father was sick last year. It all comes down to having each other when you need each other. I am so sorry to hear the sad news about your father. I hope he gets better and gets to live until he’s 90 or 100 like his family! I am sorry to hear about your father. He will be in my prayers. I hope those knitting will turn out to be happy ones, too. I’m also sending you good thoughts. It sounds like there is so much strength in your dad, family-history-wise, that things are bound to go in his favor. I’m sorry to hear about your father. I’ll be sending good thoughts your way. Oh Yvonne, I’m so sorry to hear this news I will be thinking of you and your family and hoping that your father beats this thing. Hang tough, Yvonne, you’re in my thoughts.